Rubiks cube puzzles have challenged both children and adults for generations. Every puzzle is different because there are an infinite number of combinations, making it difficult to find one "right" way to solve the cube. However, if you understand the way the cube works and master a few strategies, you can easily solve almost any Rubiks cube. Many people approach Rubiks cube puzzles merely as a collection of colored squares. 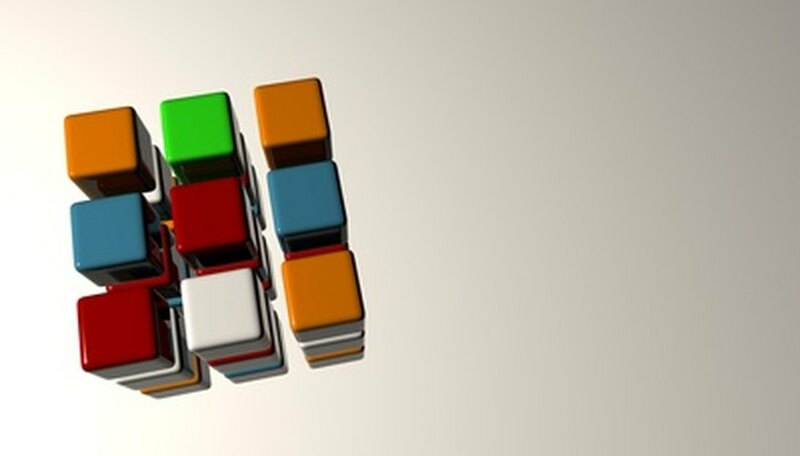 The cube is made up of six different sides which should each be one color; on each side there is one central piece that cannot be moved; the other pieces rotate around this center. 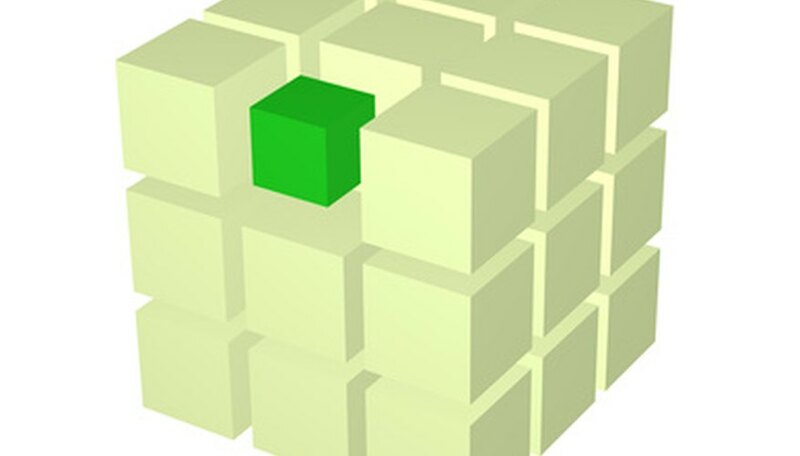 The center piece determines the color of the cube face; the green side of the cube, for example, will have a green piece in the center. Some pieces are corner pieces while others are edge pieces. Edge pieces "fill in" the borders of each face, while corner pieces stay in the four corners. It is crucial to understand this difference in order to avoid wasting time trying to move pieces to impossible locations. When solving a Rubiks cube, it is helpful to begin by entirely solving one face of the cube. You can start with whichever color you'd like; as a general rule, however, it is best to choose one that you can easily locate all over your cube. Rather than trying to solve the entire face at once, start by forming a cross in the center of the cube. The four edges of the cube face should match the center piece. Once you have created the cross, flip the cube so that the cross face is on top. Check each side of the cube (don't worry about the bottom for now.) The top edge piece should match the center. If this is not the case, rotate the cross until the edges match. Once your cross is in place, you need to place the corners. This is the most difficult part of this step, as you need to ensure that each corner is placed in the right spot. Keep in mind that corner pieces will never be found on the edges of the cube, so you can ignore colored pieces that are not in the corners. Focus on finding one corner at a time. 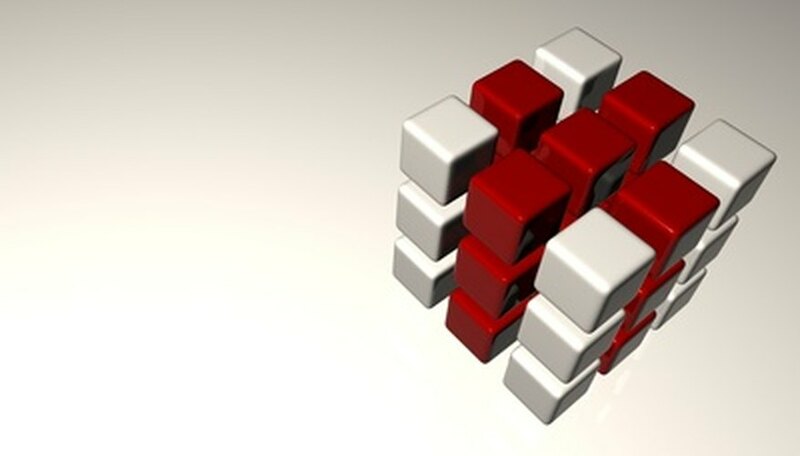 When you find a corner, note the adjacent cube colors and determine the space it belongs in. Rotate the sides of the cube to put the corner in the right place. 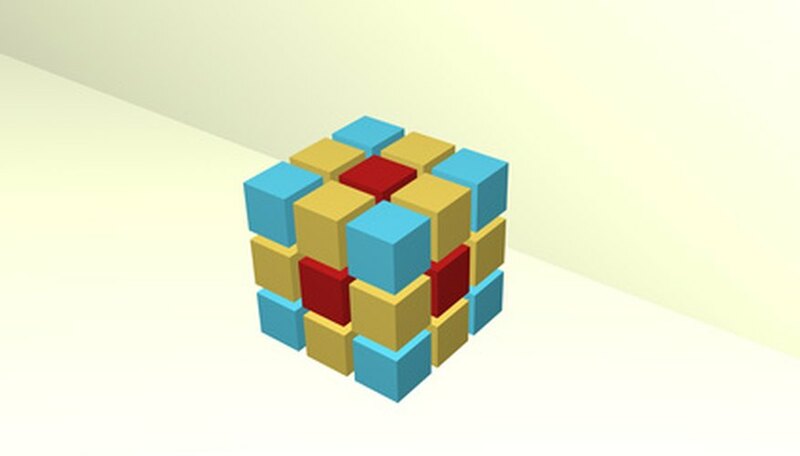 When you have finished, the top of the cube should be all one color, and each side should feature a t-shape (top 3 pieces and center piece) of the correct color. Your next goal is to fill in the middle edges. Instead of a T, you will have two complete rows on each side of the cube when you finish this step. Some of the pieces you need will be in the bottom rows. These are the easiest to place and should therefore be placed first. Rotate the bottom row so that the piece completes the T. Flip the cube so that this face is on the right side of the cube. Turn the bottom of the cube clockwise, then turn the left face clockwise. Repeat these two moves in the other direction. Turn the bottom counterclockwise, then do the same on the top. Finally, turn the bottom clockwise and the top clockwise. Some edge pieces will unfortunately be in the right row but the wrong place. The best way to deal with this is to put the piece that belongs in that space there so that the wrongly placed piece is pushed out of the way. You can then place it in the right spot using the moves described above. At this point, the top and the first two rows of each side should be complete. Now all you have left to do is solve the bottom of the cube. Begin by flipping the cube so that the incomplete bottom is on top and the complete top is on the bottom. For example, if the top is green, flip the cube so that this face is on the bottom. Examine the new top face. You want to make a cross so that you can then match up the corners. Unlike the cross you made earlier, the pieces in this one don't have to be in the right position; you just want the edges together so you can get the corners into the right place. If you are lucky, you will already have a cross on the unsolved face. If not, you have some work to do to get it ready. If the face looks like an L (top edge and left edge match the center), turn the front face clockwise, then the top clockwise, then the right face clockwise. Next, turn the top counterclockwise, the right counterclockwise, and the front counterclockwise. For all other patterns, create the cross by turning the front clockwise, then the right face clockwise, then the top clockwise. Turn the right, top, and front counterclockwise to complete the cross. It's now time to place the corners on the unsolved cube. Only two corners should be mixed up. Flip the cube so that one of the corners needing to be moved are on the right side of the top face. Turn the left face clockwise and the top counterclockwise. Turn the right face counterclockwise and the top clockwise. Turn the left side and top counterclockwise. Turn the right side clockwise and the top clockwise twice. If the corners needing to be swapped were diagonal to each other instead of next to each other, you will have to do these steps twice. Once the corners are placed, you may find some of them are oriented incorrectly--that is, the wrong color is on the face. If this is the case, you simply have to twist the corners clockwise one at a time until they are oriented correctly. You may need to swap some edge pieces to finish solving the cube. Rotate the right side of the cube clockwise twice. Rotate the top clockwise or counterclockwise, depending on if you are trying to move a top edge to the bottom of the face or vice versa. Turn the front of the cube clockwise and the bottom counterclockwise. Turn the right face clockwise twice and the front face counterclockwise once. Turn the bottom face clockwise. Turn the top clockwise or counterclockwise as appropriate, and turn the right face clockwise twice. If this does not solve the cube, repeat the steps one time and everything should line up properly. What Moves Can a King Make in Checkers?